The Add Track menu's Click Track option can be used to add a click track (metronome) to the song. The Tempo section specifies the tempo to use. Current uses the current tempo, this option can only be selected if the song contains at least one MIDI track. Using the BPM option you can specify a new tempo. 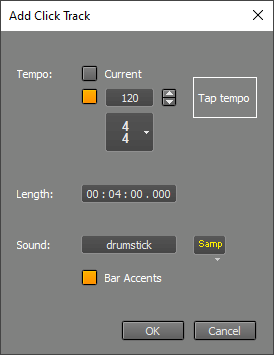 You can click a new tempo in the Tap tempo box. Alternatively you can play the tempo on the space bar. Length is the length of the click track in hours : minutes : seconds format. The Sound section specifies the drum instrument (MIDI note) and MIDI Instrument to use. If you plan on adding a drum track using an editor later, then it's a good idea to use the MIDI Instrument you'll be using for the drums in order to avoid any timing differences. After changing a Sound property a Store as default button appears in the bottom-left corner. You can click this button to remember the current settings. Bar Accents increases the volume level of the first beat in every bar. Other subtle accents may be added as well, depending on the time signature. Note: the click track will be updated automatically on editing the time signature. If you don't want that for some reason you can rename the click track (so it's no longer called Clicks.mid).